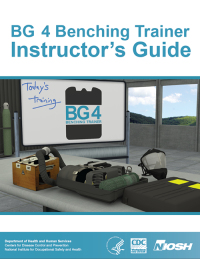 The BG 4 Benching Trainer software is a supplemental tool used to assist mine rescue personnel in learning and retaining knowledge of the process of benching (inspecting, assembling, and testing) a Draeger BG 4 breathing apparatus. This interactive software, developed by researchers at the National Institute for Occupational Safety and Health (NIOSH), places the user in a 3D interactive environment where they can visually inspect the individual parts of a BG 4 breathing apparatus, assemble the parts, and test the assembled unit with the virtual RZ tester. The software provides three different training modes which can be used by trainees learning about the apparatus and also by trainers using the software to teach. The Tutorial mode, useful for first-time users of the software, guides you through the interface and the different tools used to bench the virtual BG 4. The Intro to BG 4 mode allows users to bench a BG 4 without any flaws in the parts and at the user’s own pace. The Quick Bench mode, designed for more experienced users, generates random flaws in the virtual BG 4 parts for the user to find prior to assembling and testing the apparatus. The Scenario builder allows trainers to create custom scenarios for their trainees by preselecting flaws for various BG 4 parts. The Instructor’s Guide (included with software) illustrates the flaws that can be found on the parts in the software. A Quick Reference Guide and Instructor’s Guide are included in the software. Download and extract the ZIP file below to a folder on your hard disk. Use the Instructor’s Guide or Quick Reference Guide PDFs for more detailed use instructions.